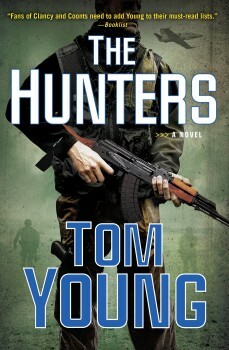 In THE HUNTERS, Young’s continuing characters, Colonel Michael Parson and his friend Sophia Gold, take on a mission like no other: Parson, on leave from the Air Force, plans to fly relief supplies into Somalia in an antique cargo plane. Awaiting them: An al-Shahaab leader who has declared all aid a sin against God and will direct attacks against planes and convoys to stop it. You set your book in Somalia. Is it fair to say that is the most dangerous place on earth? At the moment I don’t know if it’s more dangerous than Syria or Iraq but it’s certainly giving those places a run for their money. And you were drawn to it for THE HUNTERS. It’s a place that’s interested me for a while. The Black Hawk Down incident took place the year that I was going through basic training and certainly that situation caught our attention. I knew some people who were there around that time. I had squadron mates who flew in there, flying in relief supplies. I had never been in Somalia myself but I had been next door. 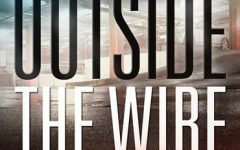 How close to reality is the mission in the novel? A lot of the airlift missions that I flew in the Air National Guard were humanitarian missions. THE HUNTERS is based on something that almost happened to me. I gave it life in my fiction. It’s so horrific when people are kidnapped in these countries. I find it particularly upsetting when freelance journalists go into such dangerous places seemingly thinking they have some sort of protection from danger they don’t have. I have a background as a journalist and in the years I was going through college there was this attitude that no one was going to harm a journalist. Even the “bad guys” for their own nefarious purpose want us to get their story out. But now we’re seeing levels of brutality we’ve never seen before. Part of the reason is with social media they don’t need us to get the story out anymore. Have you had to accommodate to that rising brutality in your work? My novels are military thrillers and there is violence in them and the level of violence is commensurate is what we’ve been seeing in the headlines. The character of Hussein, a teenage fighter in the al-Shahaab, is so well done. How did you craft him? That used quite some imagination. The background to that is my wife is very much involved in helping me edit and polish my material and she also gets involved in the front end, when I’m conceptualizing these plots. And when I told her I was thinking of writing every other chapter from the point of view of a 14 year old Somali terrorist, she said, “You’re crazy!” In the end we think we made it work. Certainly I don’t know what it’s like to be Somali but I do know what it was like to be a 14 year old boy. There’s a universality to boys everywhere. Basically in every chapter that I wrote from Hussein’s point of view I asked myself “If I were in his shoes right now and all I knew was what a terrorist leader told me, what would I do?” I wrote him as a character who though he is illiterate, he has a spark of intelligence. He is able to question things, and in fact he’s self-aware enough to realize it’s a weakness that he can’t read and that he has to believe what people tell him. How do you manage to write about the technology of flying without slowing the plot down? When I was first writing fiction about flying, I think I was tempted to put in too much detail because I’m so interested in the subject myself. But then I think with practice I got better in finding that sweet spot myself. The best advice I ever got was from a terrific creative writing teacher that you should let the reader overhear the technical details, and use them in a way that the context makes it clear what is going on. How about the success of Tom Clancy who wrote a great deal of tech? I think that Clancy included a lot more technical detail than I do. He got away with it because he did everything else so well. Different authors come in on different places on that. I think I come down in the middle. I expect you come up with detailed outlines. Not at all. You may find this hard to believe: I don’t outline at all. I had another creative writing teacher who said, “If you know what’s going to happen, why bother to write it?” Actually, when I first started writing novels this way I thought I was crazy. But at Thrillerfest and other conferences I’ve talked to people and I think about 40 percent of the writers I meet write by the seat of their pants and 60 percent outline it all. Typically it takes a year, and that includes polishing and editing. I start the day by writing new text and I will tell myself I have to write 1,000 words a day. Sometimes that 1,000 words might come quickly, in two hours, and great I’m going fishing this afternoon. But if it takes me to supper time, I’ll force myself to sit at the computer until I finish that word count goal. Tom Young served in Afghanistan and Iraq with the Air National Guard. He has also flown combat missions to Bosnia and Kosovo, and additional missions in Latin America, the horn of Africa, and the Far East. In all, Young logged nearly five thousand hours as a flight engineer on the C-5 Galaxy and the C-130 Hercules, while flying to almost forty countries. Military honors include three Air Medals, three Aerial Achievement Medals, and the Air Force Combat Action Medal. 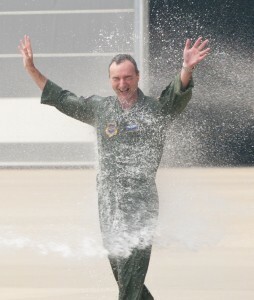 He served more than twenty years in the Air Guard and retired as a Senior Master Sergeant. 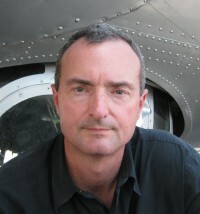 In civilian life, Young spent ten years as a writer and editor with the broadcast division of the Associated Press, and flew as a first officer for Independence Air, an airline based at Dulles International Airport near Washington, D.C. He holds B.A. and M.A. degrees in Mass Communication from the University of North Carolina at Chapel Hill. His novels include The Mullah’s Storm, Silent Enemy, The Renegades, The Warriors, and Sand and Fire.